The IELTS speaking test has 3 parts. 1. Part 1: This is a simple interview style that lasts for about 5 minutes. There are around 12 questions on 3 different topics and it’s all about you, for example your job /studies / daily routine an so on. 2. Part 2: Here you need to give a short talk based on topics on a card, it lasts about 3 minutes. (1 minute preparation and 2 minutes of speaking) The card will ask you to describe something. This is a topic based task, the examiner may ask a follow up question at the end of the 2 minutes. 3. Part 3: This a where you have talk in more detail. You may have to give an opinion and give reasons and examples with more depth to your answers. The questions are connected to the topic in Part 2. This part of the test takes about 5 minutes. Click here for example interviews and see how the IELTS Speaking test is graded from Band 3 to 9. Why can’t I get Band 7 in the speaking test? 17 commonly asked questions about the IELTS speaking section. There are four marking criteria in the IELTS speaking test. Each part is 25% of the marks for the test. Fluency and coherence will be assessed on how well your speaking flows, if you are often self correcting and pausing or hesitating, then fluency is marked down. Coherence is marked on how well the examiner can understand you. Lexical resource is marked on how good your vocabulary usage is, such as the use of collocations, idioms, paraphrasing, synonyms, phrasal verbs and a wide range of non standard vocabulary. Grammatical range and accuracy is marked on your range and accuracy of grammar, tenses, the correct use of sentence structures and avoiding errors. Pronunciation will be assessed on how clearly you speak so that you are well understood, your accent is not a problem here as long the examiner can understand you. The use of good intonation and word stress is also a marking factor here. Here is a PDF from the British council that shows how the Speaking test is marked. Click here for a lesson on Speaking part 1 and a model test. In this part of the test there are about 3 different topics and around 12 questions with topics such as: Hometown, Work, Studies, Family, Hobbies, Daily routine and so on. The main point here is to speak freely without hesitation , just speak naturally without memorising answers to specific topics. It is not necessary to give long detailed answers, just keep it simple but natural. This part of the test involves a specific topic on a card or prompt that is given by the examiner. In this case there are no questions but you will ‘Describe’ and ‘Explain’ something and talk about the points on the card in a little more detail, you will be assessed on your fluency. Here is an example card with prompts. Here you are asked around 5 questions by the examiner and you may need to give an opinion, compare, predict, talk about the past, talk about people, give a hypothetical response, give reasons and examples with a much more detailed answer. This part of the speaking test tends to be the most difficult for students, also the topics in part 3 are connected to the topics in Part 2 of the speaking test. Video lesson: different question types in Speaking part 3 with example responses. Techniques for part 3 of the IELTS Speaking test. The key to getting a good score in part 3 is to give longer more detailed answers, in this section of the test it is not necessary to worry about very accurate grammar, the main focus of this is to expand your answer with detail and an example, make sure you stay on topic also. This part of the test needs a lot of practice to reach a good band level. Part 3 of the speaking test lasts about 5 minutes. 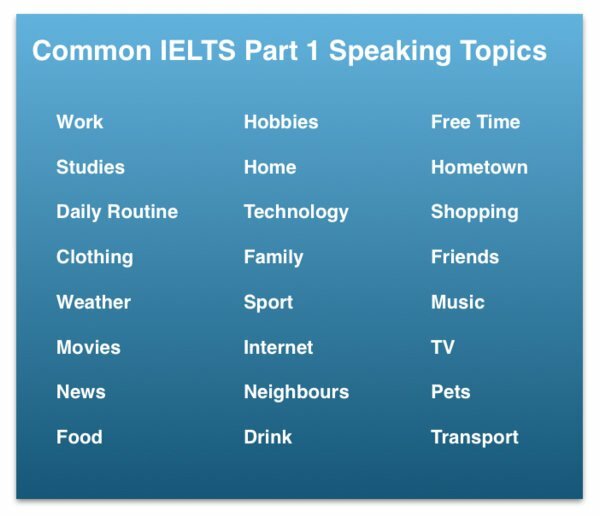 Example topics for IELTS Speaking part 3. What kinds of equipment do most workers use in offices these days? How have developments in technology affected the workplace? Some people think technology has brought more stress than benefits to people in the workplace nowadays, Would you agree or disagree with this? What are some of the reasons why people like watching television? Do you think cable TV or state TV is better? What negative effects can watching television have on children? What kinds of TV programmes are popular in your country. What types of leisure activities are popular in your country? What types of leisure activities may become more popular in the future? What kinds of food are popular in your country? Do people go out to restaurants a lot in your country? What in your opinion is a balanced diet? What are some of the health benefits of vegetarianism? How can people maintain good health? What is the health care system like in your country? What are some of the qualities that make a good Doctor? What kinds of illnesses will be an issue in the future? What is the life expectancy in your country? What are some of the reasons for poverty in the developed world? What is the future for overpopulated societies? What do you think is the best punishment for criminals? Is crime on the increase in your country? What are some solutions to ease overcrowding in cities? Why do so many people move to cities? What kinds of improvement have there been in transport in your country in recent years? How do most people get around in your country? What modes of transport will be popular in the future? Is the cost of public transport expensive in your country? Why do some people prefer to travel abroad rather than their own country? Do you think it is good for children to live in a foreign country? Do you think it is safer to travel now than in the past? How have holidays changed over the past few decades? How has Art changed in the last few decades in your country? What constitutes a good painting? Do you think children should study art at school? Is higher education very expensive in your country? Should all students pay for their university education? What advantages do universities bring to society? Which is more important, research or teaching? How should students spend their summer vacations? Which websites are popular among your generation? Is using the internet a social or solitary activity? How has the internet changed social behaviour? Should companies check job applicants’ online profiles? What will be the next big development online? What are the advantages and disadvantages of intensive training for young sportspeople? Do you think it is possible to become too competitive in sport? What is your opinion on top sports stars getting very high salaries? Some people think that competition leads to better performance from sports stars, others think it makes players feel insecure, what is your view? These topics are useful for self practice. Here is a 5 step system to practice for free. Get your smartphone with a recording app. Ask a friend to play the role of examiner asking the questions. Record yourself answering the questions as if in the exam. Do this regularly and you will see improvements.